The teasing is over and the park is almost open, welcome back to Jurassic Park. The opening image of the first trailer is of course us entering through those infamous gates, it’s a familiar scene but also unfamiliar at the same time as this is those King Kong style gates writ large as this time it isn’t 4x4s journeying through the gates but a slinking monorail. And we know that from the likes of the 1976 remake of Kong and The Simpsons that monorails never work out. The original Jurassic Park was written by Michael Crichton, and that concept was then was very much initially seen as Westworld with dinosaurs, a film that was both written and directed by Crichton. And now this return of the franchise takes that and creates a Walt Disney come Sea World theme park experience, from the panicked runners in ‘main street’ to the Shamu moment given extra spice with it being a giant swimming dinosaur, a mosasaur eating a great white shark whole. That’s a huge upgrade from the sacrificial goat of the original and is the perfect example of how the new Jurassic experience will be much bigger in scope than the 1993 original. It’s of course a giant nod and wink to Executive Producer Steven Spielberg, who both directed the original and Jaws, so what better way to signpost that where gonna need a bigger dinosaur film in the wake of the Peter Jackson Kong remake, Pacific Rim and Godzilla. It may not have appeared in the trailer but don’t think we won’t be seeing the T-Rex, there is no Jurassic World without him, he’s still top of the iconic pile and we’ll all get a nice fuzzy inside feeling when he stomps onto screen, think of it as the cinematic version of a special guest star on a sitcom getting a huge whoop and cheer. Besides he is the logo so he is contractually obliged to roar, sniff and get those gnashers out. We do know of course that there will be no return for Lord Attenborough’s John Hammond (hopefully there will be a portrait or something as a nice nod) And FX master Stan Winston who created the physical dinosaurs, both are no longer with us and that melancholy reverberates through the single piano notes echoing the Jurassic Park theme that punctuate the latter part of the trailer. The scope and feel of the new film is truly epic, who thought that anyone would ever say that the summer theme park ride of a movie, Jurassic Park would ever feel like a small and intimate film…it looks like it might next June. Glen A Larson, who has died at the age of 77, was responsible for sculpturing a huge influential part of my childhood…and if you were born in the early to mid 1970s then he probably was yours as well. In the 1970s and 80s his name as creator, writer or executive producer was pretty much inescapable. And being the 1970s and 1980s they weren’t just great TV shows but had great title sequences and theme tunes. He brought us one of the original Six Million Dollar Man TV movies, and a whole host of other fantastical TV shows besides, that were bigger, faster, stronger. 1977 saw Star Wars blast on the cinema screen but Larson created massive space opera epic, that was arguably just as iconic with its Cylons (for me far more frightening than the Cybermen or Darth Vader combined) and cool spaceships, and at one million dollars an episode (back then unheard of) he truly brought the epic of the big screen to the small screen. Although it only lasted one season there was a spinoff called Galactica 80, featuring flying bikes, a bearded Lorne Greene and Barry Van Dyke. And of course there was the successful reboot, that Larson didn’t have a hand in but still gained a consultant producer credit. 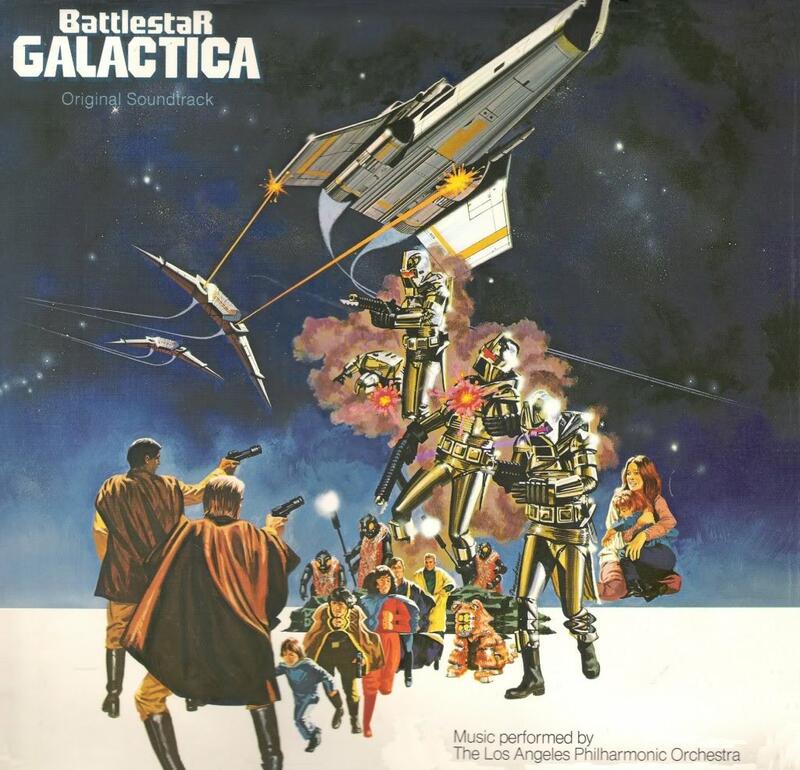 The last episode of Galactica 80 is of particular note as it featured the return of Starbuck (Dirk Benedict) marooned on a planet with just a lone Cylon for company, which plays out like a blueprint for Enemy Mine. Larson stuck to outer space with his next adventure, which like with Galactica, its pilot was released theatrically, welcome Buck Rogers in the 25th Century. George Lucas or Fox tried to bring a lawsuit against Larson re the similarities of the original Galactica and Star Wars, he even nicked special effects supermodel John Dykstra, but Lucas or Fox had some nerve really considering that the tale of Luke Skywalker was essentially Flash Gordon or Buck Rogers, so it was fairly apt that the latter was Larson’s next sci-fi epic. I had a matchbox version of the spaceship, again it was massively iconic growing up and was actually a turned down design for the Viper from the original Battlestar. Buck was kind of cool, when not busting his disco moves on the intergalactic dance floor, but everyone loved the prerequisite robot, Twiki, voiced by Bugs Bunny himself, Mel Blanc, and always confusing folk in the playground as he sounded uncannily like the Blanc voiced Yoesemite Sam. Also causing confusion, for far different reasons was the character of Wilma Dearing and her amazing lipstick! It also boasted, in my mind, one of my favourite ever title sequences which kicked off with a. Apprentice shot if Rogers spinning to the 2471. Nobody does great intros anymore. Sticking with great intros Larson also created Magnum PI, which had that car, that tache and of course that brilliant theme tune and credits. Magnum wasn’t Larson’s only foray into crime as he also created the quirky Quincy ME, paving the way for today’s CSI’s, Simon and Simon and also two other fighters against crime who, like Thomas Magnum, had rather cool modes of transport. Colt Seavers, from The Fall Guy, made me want to have a pick up truck and he had a cool bath outside, besides being a Hollywood stuntman who was also a bounty hunter, cue Lee Majors sang theme tune. Altogether now, it’s only hay, a hey, hey! 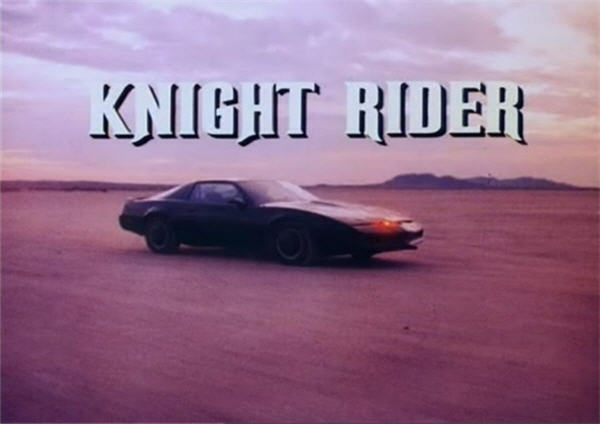 In the other show the car was quite literally the star, I am of course talking about the black Trans Am, KITT (Knight Industries Two Thousand)…oh, and Michael Knight of course! Cue pretending to talk into your Casio watch in the playground and being thrilled by your mum and dad’s car have electronic digits just like KITT, alas it lacked a super pursuit mode or turbo boost. A cool car didn’t guarantee success of course and Automan, think Tron with a car sort of, certainly had the visuals. Not all his creations had cool vehicles, one in particular was able to change his mode of transport whenever he liked as he was able to transform into almost any creature. I am of course talking about Simon MacCordinadale and his nine episode run as Manimal who week after week, American Werewolf style, transformed into everything from a hawk to a black panther, even a snake! I remember it aired Monday nights in the UK and for something that was so fleeting – it only lasted something like non episodes – is so vividly remembered. I would have gone to karate if that wasn’t airing but that show seemed far cooler than suing at the karate kid, even to my eight year old self. Years later I longed for MacCorkindale to transform in the A&E dept at Holby when he was in Casualty, alas it never happened but he did turn up in a cameo as the same Jonathan Chase character in another Larson show, Night Man in the late 90s. Whichever way you look at it Glen A Larson made some of the coolest, greatest (to the nine year old me and the 39 year old me) TV shows that have ever graced our screens. Although the great mind that created them has gone his vast body of high profile, high concept work still continues to influence and continues to be enjoyed and long may it for many more yahren’s to come (that’s years in Battlestar Galactica talk).